Greyhounds Run is a warm and sunny, near new 3 bedroom house only just over 5 minutes walk from the town square. Come and sit in the sun on the lovely sunny deck, whilst sipping a glass of great Martinborough Wine. Greyhounds Run is lovely and sunny and you can find a place to sit in the sun at any stage of the year. 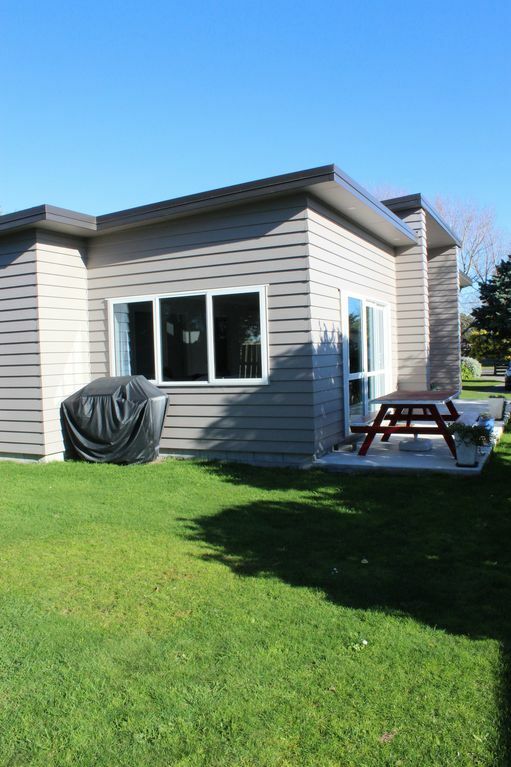 Perfect for a family get away as the section is flat and fully fenced, your dog can even come too. Please note we only accept bookings of 4-5 adults, but can accept bookings of up to 6 people for bookings with children included. Martinborough Village has amazing restaurants and cafes and there is always fun things going on. Greyhounds Run is NOT suitable for parties or hens/stag dos. Linen/towels can be provided for an additional cost. Was wonderful to be able to have the grand-dog, grand children and the parents to stay. Very warm and comfy beds. Will definitely book again. The place was the perfect size and was a great space to be able to catch up with friends! Would stay again! This is a great place to stay. We were 3 adults and 2 children, all were very well catered for, very comfortable, close to town! We had everything we needed, house was clean and beautiful! Would a absolutely stay again! !